... is a cat playpen. Katpak comes in packs of 5 and each opens up like an accordion from a flatly-folded, handled cardboard square. One Katpak can last for about 7 days, and then you toss it and the (biodegradable) cat litter in your recycle containers. 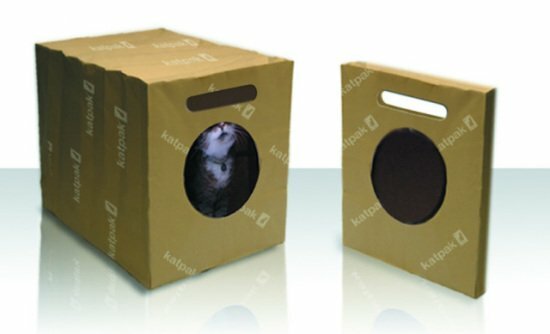 Katpak, biodegradable kitty litter box: ©Supercool Kitty Ltd. Unfortunately, the Katpak, a British invention, is not available in the U.S. yet. Look for it though; Supercool Kitty Ltd. is looking for a U.S. distributor, and I'm sure it will find one for this neat cat product. If you can't wait to purchase Katpak, you can buy it here. Swimming Elephants -- The Animal Video of the Day!! !